I opted for a higher debit connection, as I had a 100MB down and 50MB up, and my ISP had an offer, for only 7€/month more, you would get 200MB down and 100MB up. So some weeks ago I subscribed to that one. 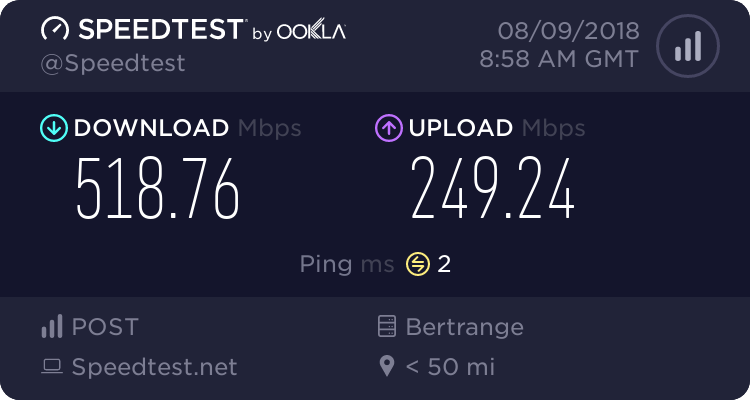 Then 2 days ago I noticed that the speed changed again, and I saw that from the 1st of August on, they changed that tier to 500MB down and 250MB up automatically, for exactly the same price. I was quite delighted. That is an insane speed. I assume you have FTTP (fibre to the premises)? Where I live we only have access to FTTC (fibre to the cabinet), so the final bit is still copper from the cabinet to the house. Maximum speed I can get is 76Mbps down and 19Mbps up, but I get more like 50Mbps. Still good enough to stream 4K Netflix and Sky. Virgin Media have been upgrading their cable fibre network in Chichester this year, and they have rumoured to be starting where I live in the next 2 years, which should offer 300Mbps or more if they do. Your prices also sound much cheaper than ours. 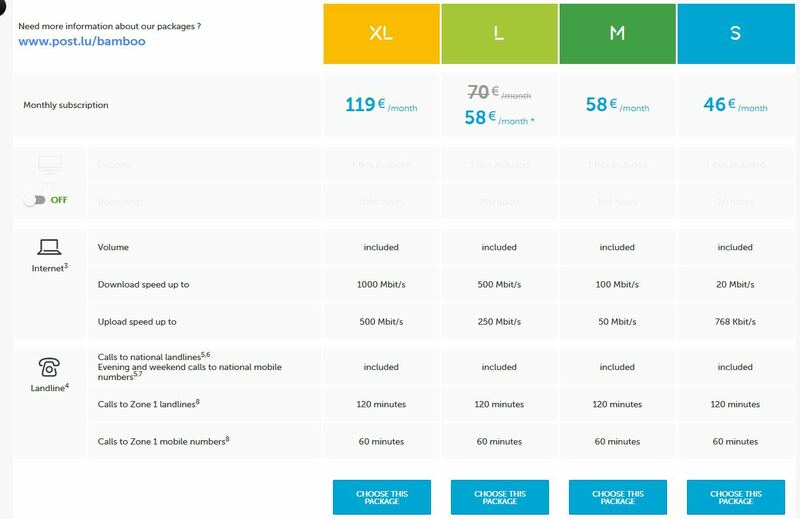 I pay 58€ a month now, you can see the prices on the picture below, notice that M and L are the same price at the moment, that's the reason I changed in the first place. The offer runs for 24 months. And as you can perhaps see, the TV option is switched off, as I have a satellite dish, thus I don't need the TV subscription from the provider. Not bad prices at all. In the UK if we have to get internet via the phoneline we have to pay line rental in addition to phone connection and then internet connection, which can make it very expensive. Many offer what seem to be good deals, but there are hidden charges or restrictions when you read the smallprint, such as a capped monthly data limit or restricted bandwidth speed. For those reasons I just stick with British Telecom as they build and own the fibre network via their wholesaler Openreach branch, and it stays uncapped and unrestricted. Not the cheapest but probably the least restricted. I think I pay about £60 a month for phoneline, unlimited calls, and unrestricted BT infinity (fttc). I also get free access to standard definition BT TV services such as AMC channel and BT sports which I can access via my Sky satellite box. Some other companies such as Sky offer their own alternatives that are similar and their lease the fttc network from BT but they end up costing near enough the same over time. BT into offer for £26.99 a month sounds great but then you look at its got a 20GB monthly cap. In a way I could forego the landline phone as we both have mobiles if broadband only was an option, and there has been some discussion about this recently with data only connections possibly offering free line rental. That would be good. Looks good. Most of my Ethernet ports don't even support that kind of speed. That's one big issue isn't it. Many fibre and cable companies are reaching theoretical speeds that can far exceed many consumers equipment. A large proportion of people now only access the internet via WiFi on phones and tablets and that can't access anywhere near these speeds. Most would be lucky if they get 30Mbps when right next to the router and more likely to get about 13-17Mbps in the real world. But you can be certain they will still sell consumers a speed they can't access. Like I assume most here do I use wired Ethernet where possible and installed physical ethernet ports around my house using CAT6 cables and wall sockets, so I can in theory use 10Gbit ethernet over the network, not that I can afford any hardware that supports it. But all my equipment is Gigabit so should be good for a bit longer. I I know in theory Cat5e can be used for Gigabit and even 10G up to 45M long but when putting the cables around my house I had to run them near to central heating pipes and alongside the electric cables so I thought Cat6 with its better shielding would be better.